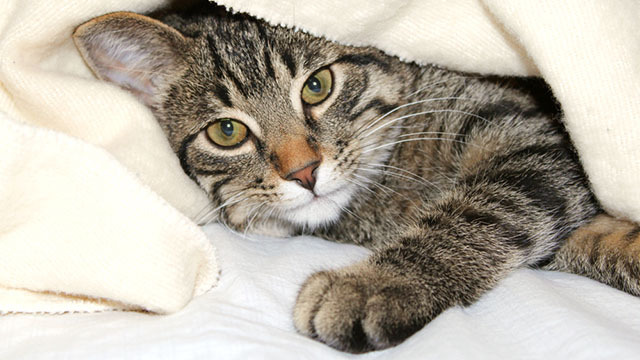 Does Your Cat Have Diarrhea, Vomiting or Gurgling Stomach Noises? Seeing our cats so uncomfortable is very distressing. Pet owners frequently try many different treatments for their cat's vomiting and diarrhea to give them some relief. Steroid medication may help initially as a feline IBD treatment, but over time it doesn't work as well and there are many side effects. Pet owners may feel frustrated after trying a variety of "prescription diets" and medications with limited success. A holistic approach for cat IBD using natural treatments and diet changes for IBD and IBS can have long-lasting results for your cat. Ask Ariel has extensive experience helping cats and dogs with IBD and IBS since 2005 which is why our natural supplements are recommended by veterinarians nationwide. Cat IBS natural remedies can offer long-term relief from symptoms, especially when used in conjunction with recommended treatments from your veterinarian. Using the appropriate hypoallergenic, anti-inflammatory diet along with our natural treatment for cat IBD and IBS such as the IBD Kit and Gastro ULC can be life changing for your cat and for you! Please scroll down and click on the product links for product details and ingredients. The IBD Kit - The IBD Kit includes 3 unique supplements specially designed for cats and small dogs to calm and soothe the digestive tract, firm up stool, relieve tummy rumbling and reduce gas, mucus and bloody stool. The Kit includes Power Probiotic, Soothing Digestive Relief and NotaSAN Anti-Inflammatory Drops--products that have been recommended by veterinarians since 2005. Ideal for pets with IBD and IBS as they are gentle, easy to use and all-natural. No Fillers! Power Probiotic - It is important to use a multi-strain, powerful Probiotic that has been used extensively with cats that have IBD. We recommend the Power Probiotic, which is easy to administer, very effective and well tolerated by cats and dogs. The product has been third-party tested and guaranteed to contain the amounts of friendly bacteria indicated on the label. Pure and natural with no fillers, Power Probiotic is the best probiotic to use for pets with IBD and IBS. Soothing Digestive Relief for Pets - This leading herbal enzyme supplement breaks down nutrients, calms the stomach, firms up stool and helps increase absorption. This digestive enzyme supplements for cats has helped finally relieve the diarrhea, vomiting and discomfort associated with IBD and IBS. The unique formulation of herbs ease indigestion and discomfort, and the product is safe enough for a cat to use it for life. NotaSAN Drops - Best seller! Natural homeopathic remedy that fights infection and supports your pet's immune system. Controls harmful bacteria and restores gut flora balance, improving digestive symptoms and immune function. Gentle, easy to administer (tasteless, alcohol-free) and safe for long-term use. Safe for small very small pets and kittens. Gastro ULC - This home remedy helps pets with acid reflux, vomiting, stomach gurgling and pain. It coats the stomach and relieves the burning and pain associated with acid reflux and acid stomach. Use this supplements along with the IBD Kit, as acid stomach begins with poor digestion. Many cats with IBD and irritable bowel are vomiting, and this creates a great deal of irritation in the esophagus and stomach. Over time, the Gastro ULC enables cats to reduce or eliminate the need for antacid medications. In addition to the supplements, some diet changes are needed. Cats with IBD should not eat grains, which are often found in prescription diets. Dry kibble is high in starchy carbs, which can cause indigestion. Cats may also have food allergies or intolerances, which further the inflammation. There is no "one perfect" diet that works for every cat. Please include your cat's diet, health issues, age, symptoms and all treats on the order form at checkout. Our pet nutritionist will review the information and include diet tips for your cat on the packing slip that comes with the product directions. Ask Ariel is committed to helping you change your cat's life. We understand that you have tried many different foods and medications, but there is hope and there is help. We have extensive experience helping cats and dogs with IBD since 2005 and our products are recommended by veterinarians nationwide. Our IBD and IBS supplements were used successfully in VCA veterinary hospitals by Pet Nutritionist Susan Davis (in conjunction with several veterinarians) for over 10 years. Ask Ariel's natural remedies and diet tips are based on her experience successfully treating cats and dogs with IBS and IBD. Most pets show improvement within a few weeks, although it is important to remember that this condition is characterized by an occasional bout of gastrointestinal distress. 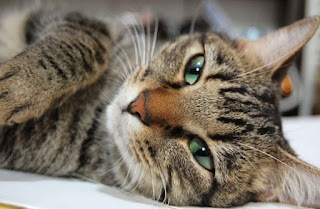 Our goal is to help reduce the frequency and severity of these bouts of digestive issues (can be triggered by stress, eating problematic foods, etc), giving your cat a good quality of life. Holistic care can make a difference, and we look forward to helping your cat finally feel better!